cans - about 200 billion every year. You can find more aluminium cans facts below. The world's beer and soda consumption uses about 200 billion aluminium cans every year. This is 6,700 cans every second - enough to go around the planet every 17 hours. It takes more energy to mine and produce aluminium than any other metal. The energy it takes to make 4 soda cans is equivalent to filling 1 of these cans with gasoline. 2 percent of the world's energy use is spent on producing aluminium. Producing aluminium from recycled aluminium cans only takes 5 percent of the energy needed to produce new aluminium. In 2006 global consumption of aluminium cans was estimated at 190-210 billion cans a year. We guess the number hasn't gone down and use the upper estimate of 210 billion cans. 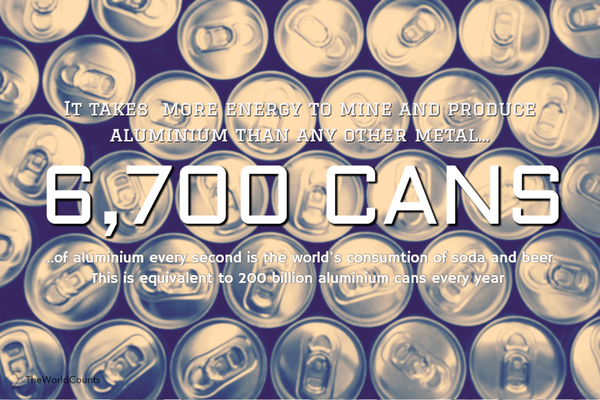 Interested in more facts like the aluminium cans? Then plug in and subscribe to our newsletter.